The story of Glasgow after 1918 and especially the Red Clydeside movement. The Red Clydeside remains an iconic moment in Scottish political history and a cornerstone of Scottish labour psychology. Scottish soldiers returning from the Great War were told they were coming back to a land fit for heroes - but the reality was very different. 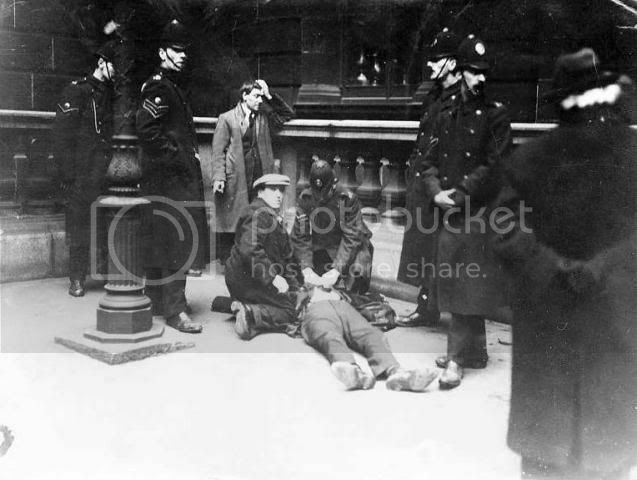 They found themselves caught up in a bitter Clydeside battle for full-blooded socialism which ended up with injury, imprisonment and tanks on the street of Glasgow. As the war dragged on from 1914 to 1918, many embittered Scots workers found themselves having to toil harder and harder without winning any financial reward for their labours. They discovered that, while the cost of living went up because of the fighting, their wages remained static. Resentment grew, until many people in the factories and shipyards believed that they should be fighting their bosses and the British government instead of the Kaiser. Their bitterness was bound to spill over into angry protest - and, shortly after the end of the war, that's exactly what happened. As the fighting ended and the troops came home from the front, fears grew that the labour market would be flooded and there would be a downturn in orders because of a drop in demand for munitions. In order to try and head off the problem, the Scottish Trades Union Congress, which represented workers then as it does today, suggested a maximum working week of 40 hours. Another body, called the Clyde Workers Committee, was more militant. It had originally been founded to galvanise engineering workers who had been involved in a strike over pay in Glasgow in 1915, and had organised a rent strike later the same year. It had also caused trouble for the government when on Christmas Day of 1915, David Lloyd George, who was then a leading government minister, had tried to persuade skilled workers in the munitions factories to let semi-skilled workers in alongside them. The CWC helped to interrupt the meeting and to drown out Lloyd George by singing the socialist anthem The Red Flag. The sensitivity over the rebellion in wartime meant that the government instructed the press not to report what had happened. In 1916, the ringleaders of the organisation were rounded up in connection with the publication of an article in their own magazine which was thought to be seditious. The leading lights of the movement, who were Willie Gallagher, John Muir and Walter Bell, were all jailed. Two other senior figures in the organisation, John MacLean and James Maxton, were also tried and jailed for two years each for the same offence. By 1919, the men had all been released and the CWC was active again. As the dispute rumbled on, it went further than the Scottish TUC and demanded that workers should only have to undergo a 30 hour week. As tempers rose, calls were made for a general strike to press the workers' case. The mood turned ugly when thousands of flying pickets were mobilised. A Glasgow power station was closed, and the threat was made that tram travel throughout Glasgow would be brought to a halt. To the government in London, the strong-arm tactics of the Glasgow militants brought fears flooding back of a resurgence of militancy on what was termed Red Clydeside. Ministers were particularly on edge because of the Russian revolution two years previously had put the Communists in power and because one of the Glasgow ringleaders, John MacLean, had been appointed as Bolshevik consul for Scotland by Lenin. The Lord Provost of Glasgow played the role of mediator conveying the demands of the strikers to the Cabinet in London. The leaders of the strike were in the City Chambers on 31 January to be given the government's response to their demands when trouble broke out. Outside the meeting, George Square was filled with thousands of strikers, all intent on supporting their leaders. In the middle of the crowd, someone raised the red flag and riot police, who were on standby, decided to charge. All of a sudden, a pitched battle broke out. The strikers hit back by throwing missiles, including lemonade bottles, at the police, who charged again. A total of 40 people, including innocent bystanders, were injured in the trouble, and the ringleaders were arrested. The Scottish secretary, Robert Munro, panicked and claimed that he had a Bolshevik rising on his hands. Troops were rushed to Glasgow, and by the next morning six tanks and dozens of army lorries were on the streets of the city. Art the end of the day, the protest achieved little. Two of the leaders, Willie Gallacher and Manny Shinwell, went to prison to serve short sentences after being convicted of incitement to riot, and the CWC ended up being discredited. Only the Scottish TUC, which quickly backed away from militant tactics, went on to prosper as an organisation. It was not, however, the end of Clydeside socialism. By 1920, the boom which had followed the war had turned to recession, with unemployment in the west of Scotland rising to a frightening 20 per cent. The government was powerless to act. Orders for railway equipment and ships -Clydeside two great international industrial strengths - tailed off. Anger over the slump led to support for the Labour party. This first made itself felt in elections to Glasgow town council in 1920 and 1921, when it made significant gains. Labour's big chance came in the general election of 1922. The party took 10 out of the 15 seats on Clydeside and a total of 29 out of the 74 in Scotland. After years of struggle, the Clydesiders had finally won real political power. Some of the brightest and most charismatic men of their generation were elected to parliament. The brilliant Catholic socialist John Wheatley was there, as was James Maxton, and Tom Johnston, later to become Secretary of State for Scotland during the Second World War. At the time, their hopes were high, Maxton in particular was committed to Scottish home rule, and felt it would only take a short time for a parliament to be established north of the border. Their radicalism, however, achieved little. They did make their mark in parliament - for instance, by being suspended for their outspokenness and rising to deliberate taunts from the Conservatives. But at the end of the day, their idealism was swept away by the stark reality of the great Depression. Ordinary Scots were too focused on simply keeping alive and feeding their families to worry too much about driving forward socialism. In many cases, too, the MPs themselves moderated their views. Red Clydeside was dead, and lived on only in name and legend. As conditions worsened, Scots took the brunt of the punishment. Working conditions in places like the shipyards were appalling, and the wages desperately low. The building of the Queen Mary for Cunard at John Brown's yard in Clydebank offered hope of better pay, but in 1931, Browns ran out of money and the project was put in mothballs. Building on the giant ocean liner only started up again more than two years later when the government decided to bail out the yard with public money. But the giant building project did little to improve the plight of Glasgow's working class, which remained one of the poorest and most wretched in Britain. As the thirties went on, however, things gradually got better, and prosperity returned. The building of a new ship, the Queen Elizabeth, brought better times after it was commissioned in 1937. Glasgow's civic pride was finally restored when it hosted the Empire Exhibition at Bellahouston Park in 1938. At last, Clydesiders could start to feel confident about themselves. It was not, however, to last. The clouds of war were again gathering on the horizon. Soon they would burst, and once again Scotland would find itself playing a key role in the hostilities. 1920 Agatha Christie writes, "The Mysterious Affair at Styles"